iCarol is more than just help line software – it is the center of a modern digital system through which you can communicate with and serve visitors via whatever channel they prefer, including text messaging and live chat. iCarol is our only product, built from the ground up specifically for helplines, non profit and charity contact centers. 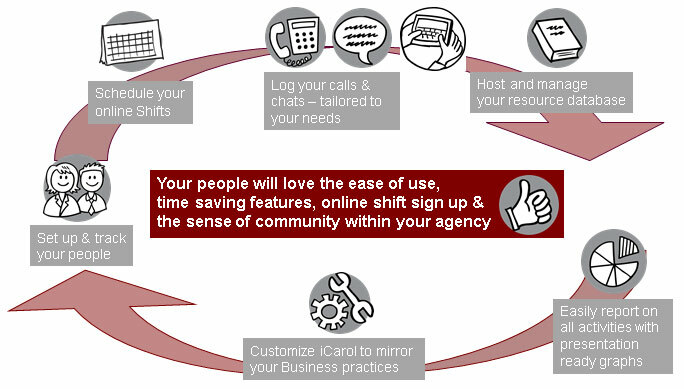 iCarol’s web based software automates the service delivery process for non profit and charity contact centers. We take your call content and live chat service, and integrate it with resource referral, scheduling and staff and volunteer management. iCarol automates the process of storing, organizing and retrieving it all. In doing so, iCarol creates opportunities for you to improve your call center’s organizational processes and results. You obtain the information necessary to be able to improve on service delivery, productivity of staff and volunteers, and the availability of volunteers. You can also measure the impact your help line has in your community and deliver the results to your organization’s board of directors and funders. We manage all of the technical details and keep your data secure. Contact us today so you can see if iCarol will work for you.